It’s a Tuesday afternoon and I am walking to the front office in the Emergency Hospital to check out for the day, when a strange man stops me, hugs me, and gives me a kiss on the cheek. Startled, I look up to see who it could be. It’s common courtesy to greet everyone with hugs and kisses, even in the hospital, but I was not sure who had just embraced me. It certainly was not one of my doctor colleagues. It took me a moment to recognize the man, but my jaw almost dropped when I made the connection that he was the man who was bed-ridden in the emergency room less than a week ago. He had been stabbed in a knife fight, and I had watched and assisted the resident doctors while they changed his bandages and tubes and cleaned up his wounds. He had clearly recognized me, but in that instant, I could barely recognize him. He was all cleaned up and strutting right out of the hospital. His black eye had faded and his face was no longer swollen. He thanked me and hugged me again, and I wished him luck as he left. I was hit with a moment of awe and appreciation for the public hospital system. In the public hospitals of Córdoba, Argentina, anyone in need of medical attention can receive it for free. While this is greatly beneficial for people in need, it also comes with its disadvantages. Resources are stretched thin, technology is not up-to-date, and doctors have to make difficult decisions to prioritize the urgency of certain cases. Even though my internship description clearly stated that I would not be allowed to touch patients (for liability reasons), often times the doctors needed an extra pair of hands, and they relied on me to help out with anything I could. The residents eagerly taught me new skills and let me interact with patients. I must say, I was a little overwhelmed on my first day in the emergency room when a flustered doctor practically threw a pair of gloves at me and told me to clean a patient’s wounds as he was rolled in on a stretcher. The constant influx of patients and fast pace of the work environment put me in a position to learn and adapt quickly. 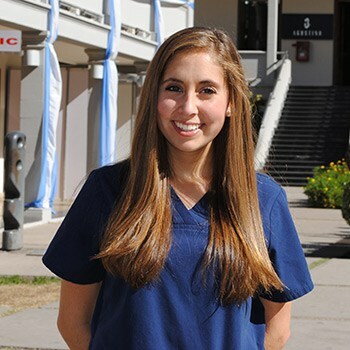 The ER environment not only challenged me to improve my Spanish and knowledge of medicine, it also enabled me to discover my passion for clinical medicine and confirmed my desire to pursue a career in the medical field. I traded my Florida summer for the Córdoba winter and spent a total of twelve weeks in Argentina. During my internship, I spent seven weeks in the children’s hospital and three weeks in the emergency hospital, and I used the extra two weeks to travel throughout different regions of the country. My rotations in the hospital consisted of different specialties, including general consultation, surgery, rehabilitation and dermatology. Usually, I was able to help with patients and assist doctors with simple tasks. For example, I was able to weigh and measure children during physical examinations, check out rashes in dermatology, and pass doctors materials during surgery. More often than not, the doctors were willing to answer my questions and explain cases to me. I would spend four to five hours each day in the hospital and then take the bus back to the center of town to participate in medical Spanish classes offered through the internship program in the afternoon. During my free time in the evenings, I would run through Parque Sarmiento to keep up with my schedule of cross-country training. Additionally, I was able to spend my free time visiting with my extended family on my mother’s side. They graciously welcomed me at every opportunity and truly made Córdoba a place I could call home. The Johnson Opportunity Grant made it possible for me to have a hands-on experience with medicine in a country and a culture that are meaningful parts of my heritage. I spent a summer as a DART intern at Mt. Sinai School of Medicine investigating drug therapy for genetic disorders. I spent a Spring Term in Italy, traveling and painting with the Drawing Italy class. Why did you apply for the Johnson Opportunity Grant? I knew that I wanted to go to Argentina, particularly because my mother is originally from there, and I wanted to improve my Spanish. I also wanted to pursue an internship that tied in my career goals in the medical field. How does your work under the grant apply to your studies at W&L? I spent my summer shadowing and assisting in the public hospital system in Cordoba, Argentina. I’ve always known that I wanted to go into medicine, but my experience there really confirmed my desire to pursue clinical work. In my science classes, I learn a lot about the mechanisms behind medical cases, but in my internship, I was able to apply these concepts to real situations and cases. Did any specific courses or professors help you prepare for this internship? Professor Alty and Professor Stewart really encouraged me to pursue this internship and helped me realize the confidence I would need to live alone in a new country and engage in hands-on clinical practice. Additionally, Anatomy and Physiology with Professor Blythe gave me the foundation and crucial background information to be able to understand the medical scenarios in the hospital. What was the most unexpected aspect of your grant experience? I was really blown away by the warmth and generosity of the people I met, especially my extended family. Family is such an important construct in Argentine culture, and it was an amazing experience to feel so welcomed by people whom I barely knew. I left feeling very connected to the people I had met. What key takeaways/skills are you bringing back to W&L? I think my key takeaway from this experience will be the application of the things that I learned about in my classes to real, live clinical situations. This experience will help me with my classes and activities at W&L, including shadowing at Stonewall Jackson Hospital. Post-Graduation Plans: I plan to do a year of clinical work in a hospital before entering Physician’s Assistant school. Why did you choose your major? The neuroscience major gives a lot of flexibility, as it is an amalgamation of the disciplines of biology, chemistry, psychology, and physics. I liked that it encompassed all my interests and didn’t tie me down to solely one subject. Advice for prospective or first-year students? Make sure not to just use college as a path of stepping stones getting you from one place to the next. It’s okay to not know exactly what you want to do with your career yet or how you are going to get there. Take time to pursue something that makes you happy or inspires you, and be diligent about it. I think the rest will fall into place. Advice for students interested in an internship abroad? My advice to a student who interested in doing an internship in a different country is to give yourself enough time in the country to really feel settled and integrated within the community. Immersion is really important for language purposes and to have the best cultural experience. Also, don’t be scared to embrace new or uncomfortable situations.